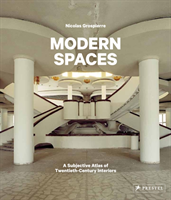 In Modern Forms, Nicolas Grospierre traveled the globe to sample the best modernist buildings from the 20th century. Now, he takes his camera indoors to show how modernist ideas are manifested within the walls of buildings both famous and obscure. Rather than a chronological or geographical tour, these photographs are organized in a visual flow, that allows readers to appreciate similar characteristics in interiors that would normally never be grouped together. Shot in the same distinctive and striking manner as his previous book, these images reveal the forms that define modernism. Built with forward-looking, Utopian ideals, decades later, they exist in a startling range of conditions, from dazzling to downtrodden. Through the visual flow of the book, readers can make connections between a private residence in Sri Lanka, a stair- way at the Ministry of Foreign Affairs in Brasilia, a cinema in Bangkok, a bus station waiting room in Odessa, and the vaults of a bank on Wall Street, New York. Responding to our desires to categorize and catalog, this photographic journey crosses spatial and cultural borders to tell the story of modern architecture.